Get a fast, upgraded computer network without shelling out the big bucks. With Cook's Computer's cloud solutions, your employees can share, edit, and publish documents in a unified system. This allows your business to take advantage of improved communication and simplified business processes. 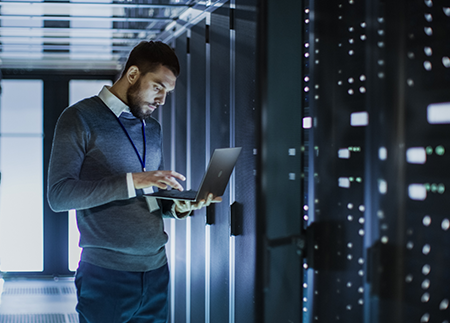 Since all your hardware, software, and network are hosted in the cloud and monitored by our experts, you'll never have to worry about set-up, management, maintenance. And with our pay-as-you-go model, you never have to worry about paying extra to upgrade your software or purchase more hardware. • Hosted Microsoft Dynamics and CRM - Collaborate in Microsoft Outlook and other applications to unleash sales, marketing, and service potential with lead and opportunity management tools, marketing automation, and end-to-end management. • Hosted Microsoft Exchange - Enhance your company with business e-mail and collaboration tools like shared calendars, contacts and tasks, public folders, and email at your chosen domain. Also, add on BlackBerry, iPhone or Windows Mobile devices – all for a flat fee. • Hosted SharePoint - Together with Hosted Exchange, SharePoint 3.0 allows real-time collaboration over your company intranet. Store documents online, review files, write blogs and wikis, and manage mailboxes with this powerful tool.